The universal mounting bracket makes attaching a Bobike mini, or a Bobike mini City to a bicycle really easy. The universal mounting bracket can be used on bicycles with either a standard handlebar stem or an A-head construction. No need for different kinds of mounting blocks anymore – just one handy universal mounting set. 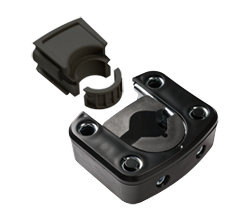 The universal mounting bracket is standard equipment for the Bobike mini and Bobike mini City. Having an extra mounting set is handy so that you can attach the mounting bracket to a second bicycle. This allows you to switch the seat from one bicycle to another.